In 2010, due to repeated flooding of the Whitehouse Nature Center parking lot, the decision was made to install a rain garden. 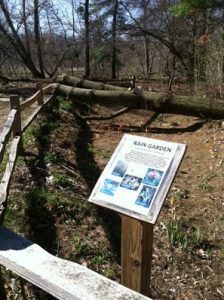 The rain garden was excavated by a private contractor with the assistance of Boy Scout Troop 337. The rain garden was designed so that rain water from the parking lot would empty into the garden where it would collect and drain within 3 days time. Over 50 young flower plugs were planted on November 19, 2011. An effort was made to plant exclusively native species. As of summer 2012, most of the original plugs had survived. Due to the extensive damage from the 2013 Albion Microburst, the rain garden is in need of some repair. Most damage was done by a large tree falling on the fence surrounding the garden.